Convenient removes make-up and even waterproof mascara. Cleanses mildly, moisturises and cares for the skin. The sensitive formula with Dexpanthenol is especially caring for sensitive skin. Free from perfume, colourants and alcohol. The skin is cleanses, moisturised and cared for, looking healthy and beautiful. 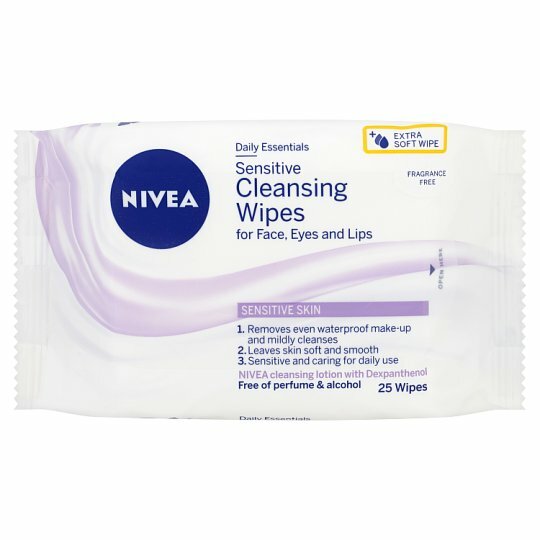 Gently cleanse face, neck and eye area with the soft wipe, keeping eyes closed. Carefully reseal the bag after use with the self-adhesive label to prevent drying out. Do not flush. For optimal results use the whole range NIVEA® products for sensitive skin.